This is my latest portrait commission done for a Christmas gift. The main dog is Sweetie, a Sheltie and her friends are Pee Wee, the Chihuahua on the left and Maizy, a Chihuahua/Dachshund mix on the right. I chose to do this piece in gouache and colored pencil on a very smooth, hot pressed paper. I chose this combination to try and get the detail of the hair and coat patterns and I also wanted a soft, washy background. The smooth paper lends itself very nicely to detail work. I feel like I achieved the look that I was after and my client was very pleased. Now that this piece is finished I am looking ahead to what is next. I have been pondering and praying over what direction to go in with my artwork. 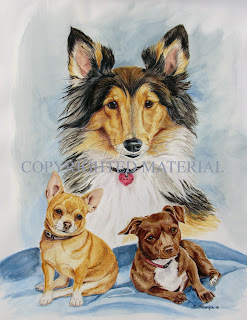 For the past two years I have focused on painting pet portraits and have really enjoyed that and have made some wonderful friends through this process. However, for the past few months I have been feeling like there is something more. 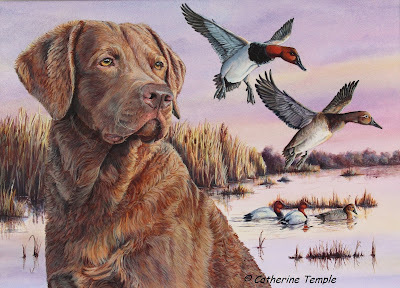 I would very much like to branch out into sporting dog art and wildlife art. I would also like to learn to paint in acrylics. Taking a step in a new direction is both exciting and scary. It's that fear of the unknown and that fear of failure. Sometimes we have to have faith and consider the "what ifs" in a positive way. I am at that place right now. In the days ahead I hope to start down this new path with confidence and not with fear, with anticipation and not with dread. I hope that the work that comes out of this time will be inspiring, both to me and to others. I'm not entirely sure where it will lead, but I think I'm ready to place my foot on the path.